We’ve just welcomed autumn and although the weather is not precisely autumn-like, one already fancies dishes which are more typical for this time of year. 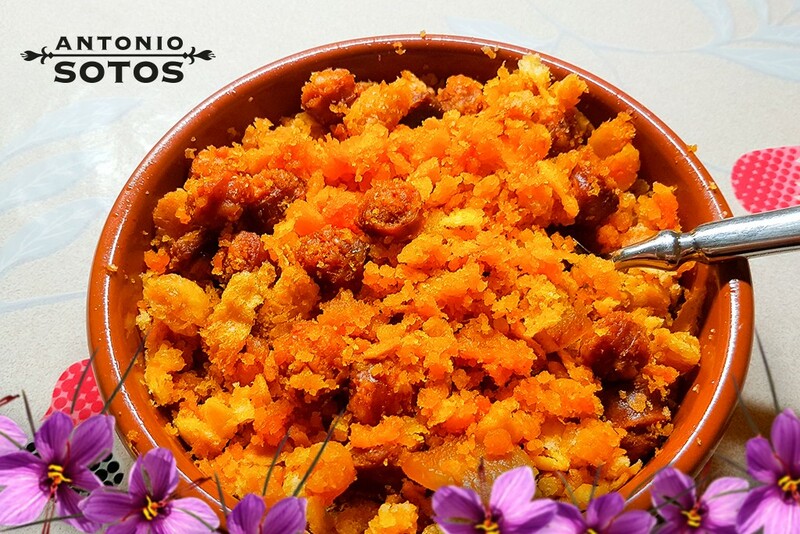 For that reason, today we’re bringing you a delicious Saffron migas ruleras (fried breadcrumbs) recipe. The first consideration to be taken into account before donning on an apron and making a batch of these saffron migas ruleras (fried breadcrumbs), is to prepare, at least a day ahead, a saffron infusion. And when it’s ready, let stand, but don’t strain it! That is, don’t remove the saffron strands, as in this recipe it’s very handy to preserve them. Also when you’re about to make the recipe, remember that stale bread, at least two-days-old, must be used. That way the bread will crumble better and will better absorb the water. Let’s see now, how to prepare these saffron migas ruleras (fried breadcrumbs). In a large frying pan, lightly sauté the garlic and when browned, remove from the frying pan so that the garlic does not burn during cooking and set aside. Dice the peppers into medium slices and fry. Once sautéed, remove and set aside with the garlic. Sauté the bacon and chorizos. Once browned, remove and place on a kitchen towel to remove the excess oil. In the same oil, toss in the diced bread and stir. Pour the saffron infusion onto the crumbs and stir. For some finger licking migas ruleras (fried breadcrumbs), the more the contents are stirred, the better the taste. Should you prefer, moisten the bread with the saffron infusion before tossing into the frying pan. To that end, slowly moisten the bread and stir thoroughly so that all the ingredients are equally soaked. When the migas (fried breadcrumbs) are ready, add the ingredients which have been set aside and mix thoroughly. Serve with some grapes and enjoy!